Can you please let us know how can we authenticate users present in weblogic realm in ADF browser/client based? We tried deploying the application on to Android simulator, apparently the Default Login Page fails to appear, instead a blank page shows up without any option for accepting user credentials. Are we missing out any steps or the default login page only comes up for iOS simulator ? Did you tested on your environment with iOS simulator? I wasnt testing with Android simulator, but it should work - unless there is a bug. May be Android simulator is not configured as per docs. We had no luck to try this in Android device, its says login failed for no reason. 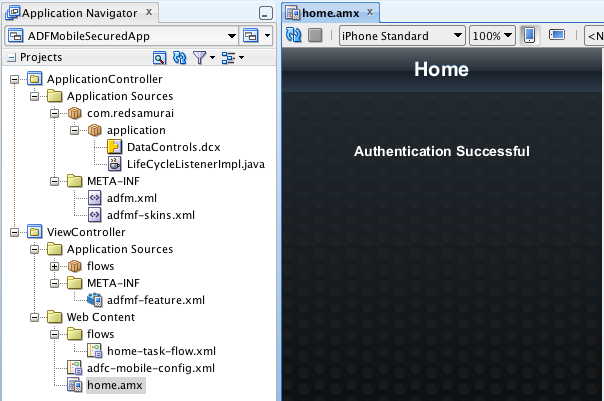 And can you please give some pointers how can we authenticate from ADF Mobile with users defined in weblogic? This blogs describes how to authenticate with users defined in WebLogic. Did you deployed - ADFBasicAuthApp and check URL's are correct in connection.xml file from ADFMobileSecuredApp. You will have different IP, change it to point to your WebLogic. We have deployed basic auth on our weblogic server and we are able to access the same url from the device, which prompts for credentials. And same url is provided in adfmf-application.xml by editing the security server connection. When tested connection it says Successful. And aslo we have verified the connections.xml having same url. But when deployed into Device, no luck. I meant how can we authenticate against users present in web logic realm. It works for me on iPhone simulator and from iPhone device also. Please test if it works on your environment from Android simulator. Sample app from this blog authenticates against users present in WebLogic security realm. It is tested with iPhone simulator and real device. No luck, same issue in emulator as well. And even i tried with projects creation which resulted in same error. This means something is not right on your environment. There is no other version, only JDev 11.1.2.3.0 supports ADF Mobile. Noticed that when the login url service is down, we get "Cannot Connect to login server. Check the network and try again" error message. And when the service is UP, we get "Authentication error with unknown issue". Can you please let us know if we can debug this issue? This means your basic ADF authentication is wrong. Or also possible that ADF Mobile application is not configured properly to get authentication info. What server you are using for authentication - WebLogic? Yes, its weblogic 10.1.3.5 64 bit. Are you able to login to ADFBasicAuthApp from desktop browser? We are able to login (any user deined in weblogic realm) into ADFBasicAuthApp from desktop browser and also mobile browser as well. Since your ADFBasicAuthApp was in JSF 2.0, i had migrated to downgrade to JSF 1.2 and deployed in weblogic, during that process the below line got missed from jps-config.xml file. I believe this is MY MISTAKE , as migration does not delete it. 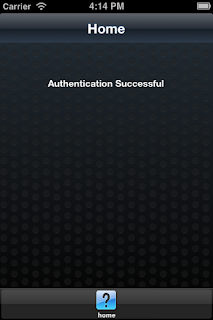 So now i am able to authenticate any user defined in weblogic realm. I sincerely appreciate you for constantly replying to my queries. May be the last question in login usecase, how can we achieve LOGOUT functionality here. I see in Dev guide, stating to call java class. Can you please let me know on this? I will put this on my todo list. And also it would be great if you can let us know how can be display different icons in Login Form and Home page. Please help. Let me know what I am doing wrong. This means your server is not configured with ADF 11g R2 libs. Application is very basic, is just plain ADF app - it should work nicely. Thanks for the reply. I am getting the following error. [10:30:23 PM] See server logs or server console for more details. [10:30:23 PM] ---- Deployment incomplete ----. Yes - this is WebLogic configuration error. You should open WebLogic console in the browser, navigate to Deployments section and open jsf 2.0 library. In the Targets sections make sure checkbox is set for your Managed Server. We are trying to install weblogic server individually and would like to use it for Mobile ADF. Please suggest which version of weblogic and jdeveloper to use which is compatible to each other. Do we need to apply any new patches after installinh these two components. You have really supreme things here, but this ADF mobile sample simply does not work correctly or I misunderstood something. I also read this URL: http://docs.oracle.com/cd/E35521_01/doc.111230/e24475/security.htm. If I understand correctly ADF mobile should work like this: you login into server on some link and retrieve session cookie (JSESSIONID). Now on all other requests, when you call secured web service(s), you send JSESSIONID cookie to the server, the server recognizes you and sends you data back - so login is perfomed only once. I deployed your sample to server and build my own (tried two servers) and behaviour is the same. 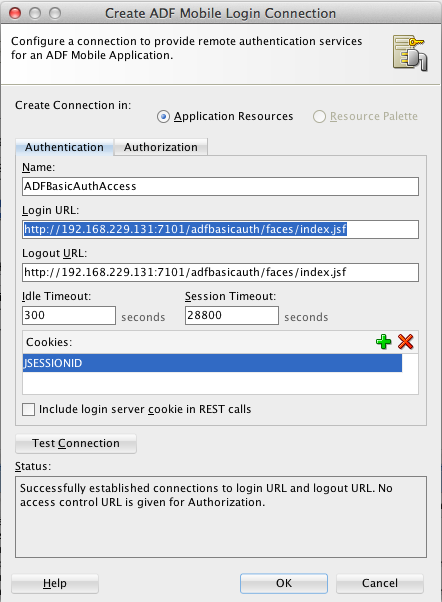 ADF mobile does NOT send JSESIONID in web secured service calls - so authentication is performed again and again and again (i see different session ID each time I invoke web service). I checked the requests of web services calls and Cookie JSESSIONID=someNumber is not present in the header of HTTP request. But in header of SOAP request there is a username and password present and based on that data the login is executed at every call of web service. 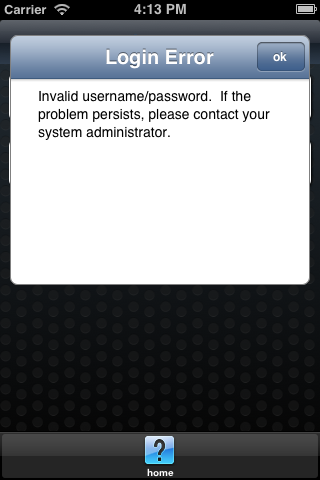 Question for you is: is this correct behaviour when you call web service from ADF mobile? 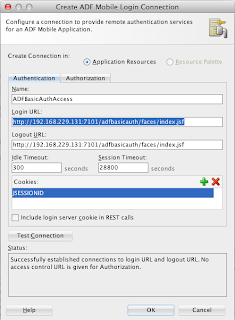 What's then the point of JSESSIONID cookie in ADF mobile if it is not used in web service calls? The webservice calls and ADF mobile client bahves the same even if I remove JESSIONID from project configuration. Can you comment please? P.S: if I create normal ADF mobile application with username/password authentication and browse pages, JSESSIONID cookie is used and work correctly. Hi, i provide only working samples :) i will reply to your questions after holidays. Make sure adfCredentialStoreKey is set correctly to the same value for Login and Web Service connections. Now I am trying to connect thru REST to access Fusion CRM WS : PersonService. When I am creating URL Service Data Control. Getting below error, I’m unable to proceed. PFA error screenshots and SOAP Request & Response XMLs. Can you please help me how to overcome these errors. Thanks a bunch in advance for all your help and time. I would suggest first to test with regular ADF application, to check if Web Service works. Only then try to access it from ADF Mobile. 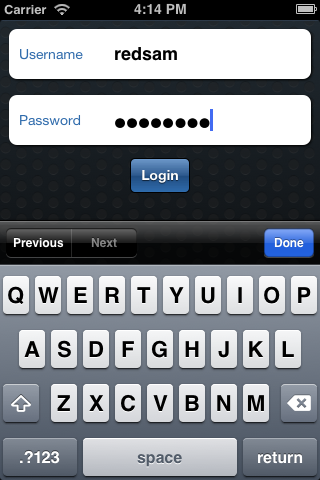 I followed exactly similar steps to add secured login functionality to my Mobile App. But Login doesn't seem to work. 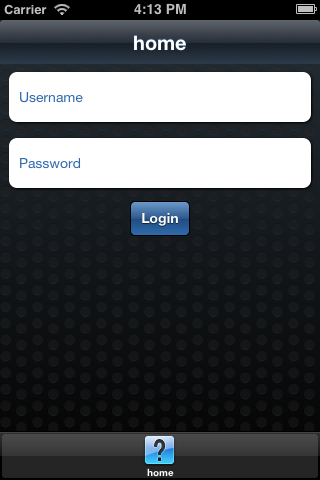 However, I am able to Login into the Authentication server URL through Mobile browser. Not sure what is missing. Login Screen from Auth Server is prompted but on giving right credentials, I am unable to Login. Would you pls suggest any alternatives..? I have successfully implemented the adf login functionality with weblogic server as described in your post, but further i need user authorization, can you please tell how? Check if there is any log printed on ADFBasicAuthAPP application side. Also check if redsam user was created in WLS. I want to configure the ADF Mobile app being authenticated with our corporate active directory which is MS AD 2008. When using standard URL "ldap://abc.com/ou=users,ou=ppl,dc=dev,dc=uws,dc=edu,dc=au" (no quotes) and Testing Connection, I get "Login URL is invalid." message. All tutorials online and documentation refer strictly to WebLogic authentication. 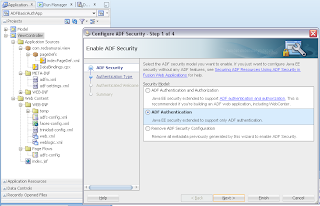 Please help on how to configure ADF Mobile authentication using MS AD. I doubt if this is supported. I was able to deploy succesfully to Android emulator. First time i tried didn´t work. Login screen just wasn´t showing. Then i realized that in adfmf-application.xml in the security tab, the Login Server Connection you created wasn´t selected on the Application Login Server list. Just select and the app works fine. I think it was selected, may be JDev unselected it in your computer. Can you just guide how to integrate ADF Mobile Login functionality using REST webservice which accept username & password and validate those with database values and return the response accordingly. I have tried deploying your sample application to Android emulator, but the login page did not appear. Only a blank page shows up without any option for accepting user credentials. Also checked that ADFBasicAuthApp has been deployed successfully to WebLogic server and the URL's are correct in connection.xml. Am able to login to ADFBasicAuthApp from desktop browser as well as from mobile browser. Will there be any missing steps or libraries? Appreciate your advice and guidance on this. Hard to say, as I was testing with iPhone only. I had the same problem. If I tried the sample on my Mac with iOS it worked fine. Then I tried the same on Windows with Anroid. No luck, black screen. After some investigations I found in adfmf-application.xml on tab security the field "Application LoginServer" was empty. I choose ADFBasicAuthAccess and tried again and it worked. Thanks Andrejus for the great post. I'm not sure why other people keep posting that they aren't getting this to work on an Android device or the emulator. I had no issues. Great ! Thanks for update Xantros. Not sure. As per Xanthros reader comment above - it works for him on Android. when deploying ADFBasicAuthApp in weblogic server i am etting exception like oracle.adf.view.faces.bi.webapp.MapProxyServlet. If you did can you test your sample and try to login second time? It seems bug there, it would say the login server is not reachable. I have demo with same issue for second time login. Didn't had time to look into it yet. 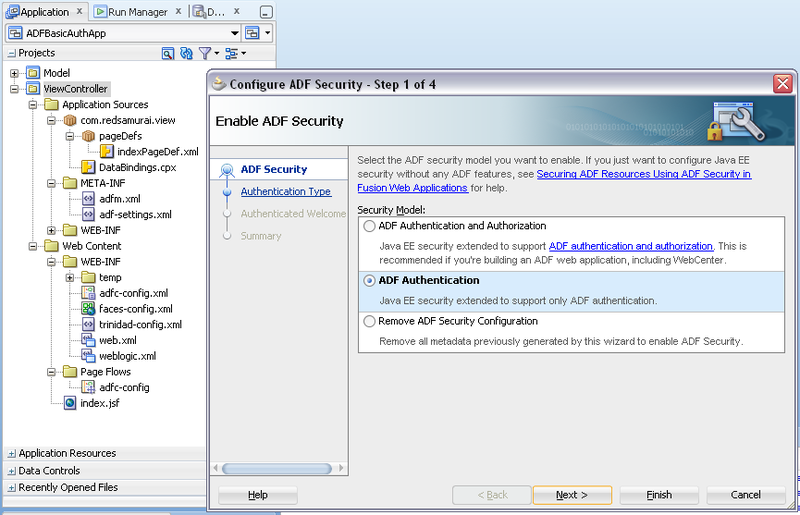 I have an ADF application secured with FORM BASED authentication. I'm noticing that every documentation refers the use of basic auth. 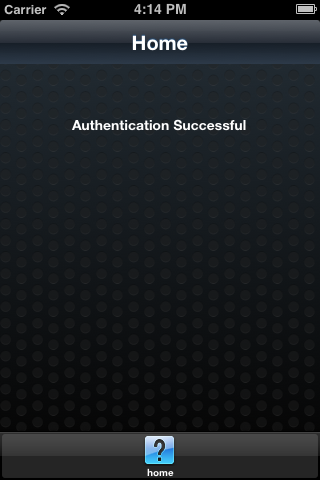 Is it posible to use ADF Mobile authenticating through this method? If so...how? I am trying to implement login functionality. But on deploying to android emulator, it says cannot connect to server. Could you please tell me how to fix it.I am using jdeveloper 11.1.2.4.0. I was testing it with iOS only, not sure about Android. I'm trying to save the session that the user will be in after successful login, so that the application will not abort/stop once the user hits the back button on an android device. It seems that the "stop()" method in the lifeCycleListenerImp class is always fired on the back button press. Can you provide us with pointers on this subject? much appreciated. How can we do this when application uses facebook or google credentials to login?